Nancy's Nook : Doesn't this picture look yummy? Different note: Zero Church was great last night. There were 56 in the auditorium with several new faces! Sam did a wowy job with his magic show. And yet it wasn't too wowy. Just right. Anyway, it was all fun and then serious-- the message was great at the end -- well, right before the guillotine trick. Different note: who's not ready for this election to be over?!? Thanks for you comment on my story, Nancy! I can't tell you what a relief it is to know someone thought it was at least good enough to want more. Schwew!!! You are right, I'll be posting a new section everyday. I'm almost finished with the section for today -- got a late start today, but it will be posted today before I go to bed. Probably before supper. 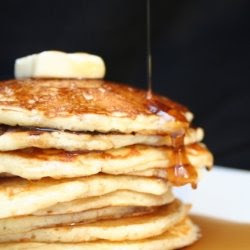 Speaking of supper and about the pancakes -- a tradition in our family on Sunday nights is to have breakfast for supper, and after seeing that photo, I think I'll make some pancakes instead of popovers. That picture made my mouth water. Wonderful Zerochurch went so well. I plan ot come next week, but I already had a birthday party scheduled last night so I couldn't make it. Funny about Ryan and the guillotine. Good for Sam -- keeps everything in the right perspective when it comes to the lovely Laura Carmack! And, YES!!!! I'm ready for the election to be over. OMG YES!!!! A long time ago there was a Christian comedian who started one of his routines by saying "It's Friday, but Sunday's comin'." Well, in the case of the election, I think we could all say, "It's Sunday, but Tuesday's comin'!" Thank goodness.